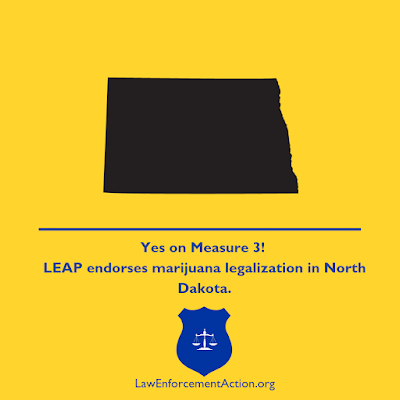 Today, the Law Enforcement Action Partnership (LEAP), would like to announce our endorsement of North Dakota Measure 3, a law that would legalize marijuana for adults 21 and older. 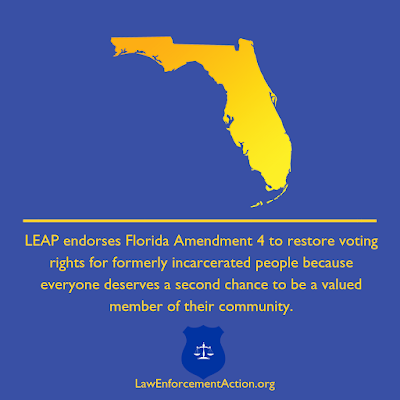 Today, the Law Enforcement Action Partnership (LEAP) would like to announce our endorsement of Florida’s Amendment 4, a law that would restore voting rights to most convicted felons who have completed their sentences. 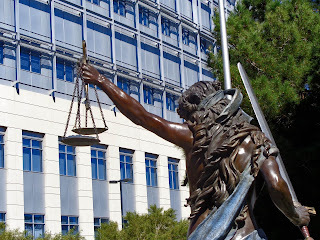 The law is designed to improve the reintegration process for formerly incarcerated people. 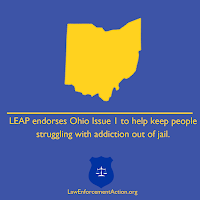 Today, the Law Enforcement Action Partnership (LEAP) would like to announce our endorsement of Ohio's Issue 1, a ballot measure that would reclassify many drug crimes from felonies to misdemeanors and divert cost savings into drug treatment, rehabilitation, probation services, and victim support programs. The law is designed to reduce the number of people in state jails and prisons for low-level drug offenses and non-criminal probation violations. Today, the Law Enforcement Action Partnership (LEAP), would like to announce our endorsement of Michigan ballot proposal 18-1, a law that would tax and regulate marijuana for adults 21 and older. If voters approve the measure in November, adults would be permitted to purchase, grow, and possess up to two and one half ounces of marijuana while retail and cultivation facilities would be required to obtain licensure through the state. What advice would you give to your younger self?Lieutenant Tony Ryan (Ret.) joined LEAP early on, more than a decade ago. He did it because he knew that bad policies like the War on Drugs were destroying communities and making policing a more dangerous job. He couldn’t stay silent, because good cops like Tony speak up for what’s right. They see law enforcement as an honorable profession, and they rise to meet the challenge – working toward bringing policing back to what it should be: protecting and serving. 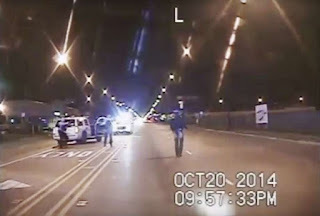 Friday last week, Chicago police officer Jason Van Dyke was convicted of second-degree murder for killing 17-year old Laquan McDonald in 2014. Van Dyke is the first Chicago PD officer to be convicted of murder in 50 years. Below is a statement from the Law Enforcement Action Partnership's executive director, Major Neill Franklin (Ret.). The following is an interview with Law Enforcement Action Partnership representative Det. Vince Felber (Ret.) of the Akron Police Department in Ohio. He left policing after 20 years of service and now works with LEAP to educate people about the effects of the justice system on communities living in poverty and how they impact police officers' ability to do their jobs. Mikayla Hellwich & Monica Westfall: Can you tell us a little bit about yourself and what you did in law enforcement?